Selected as one of Tommy Brownell's Top Six of 2013! Heaven's Shadow is the first game published under the Bedroom Wall imprint. Written and designed by John Berry, this is a game of faith and assassination set in the modern world. 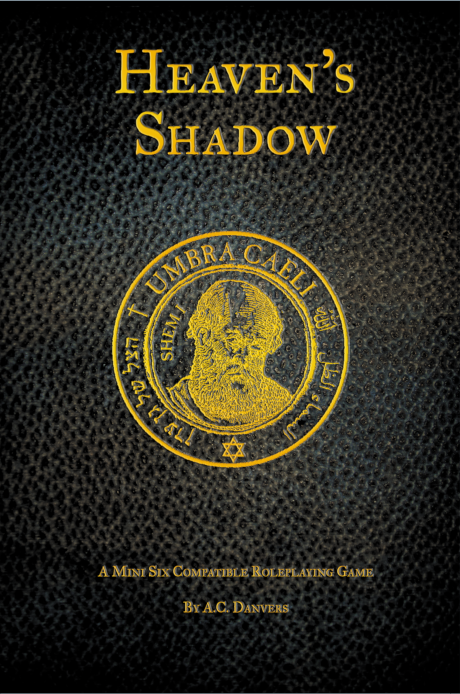 Players take on the role of Shadows, assassins in the service of God, empowered by Faith to hunt down and eliminate the ancient Nephilim. Immortal demonic beings in the guise of normal men and women, the Nephilim have dwelled on Earth since the days of the Great Flood. Working in concert with a secret Agency of fellow believers, the Shadows are tasked with the assassination of these evil beings in order to end their Path of Sin. The system is based on Mini Six, the excellent OpenD6 variant developed by AntiPaladin Games, modified to suit the trappings of modern-day supernatural espionage. For those unfamiliar with the classic D6 system, it is a simple D6 dice pool system designed to be easy and quick to run and play, and has been used in such classic RPGs as Star Wars and Ghostbusters. Player skills are enumerated by a number of dice, which are then rolled against each other or a target number to determing success. The Advantage System: A new system for handling extended challenges based on gaining and holding advantage over one's opponent in the form of bonus dice. Planning the Hit: Planning a successful assassination takes time and careful execution. By making a detailed plan, and executing each seperate task successfully, players earn bonus dice for the killing shot. Faith and Prayer: Players grow in their faith, and through that faith can call on aid from the Supreme Director in the form of Prayers, small miracles designed to help them in the task of the Watch. Special Training: Characters earn additional points in character creation for providing backstory for their skill choices. The digital version includes both PDF and EPUB editions of the game, in order to better serve our users of digital readers and other such devices. The PDF and print versions come in 6"x9" format. It's צלו של גן (ה)עדן or even צל עדן. הצל של גן עדן, while not incorrect grammatically, is on a low register than you'd expect on this. I keep wishing anyone who wish to use Hebrew will actually consult a native speaker, but to no avail. My sincere apologies. I cannot at this point recall exactly how I went about making that translation, but Heaven's Shadow was made under a very tight schedule (the first draft was a NaGaDeMon entry), so I had to rely on what tools I had. A lot of my references were more from the Christian/Biblical side I'm sad to say, and I'll admit those can be a bit ... odd, when compared to either modern or ancient Hebrew as any native might recognize them. This title was added to our catalog on January 25, 2013.